Organized by Mike Lafferty of Fainting Goat Games, the Southern Poverty Law Center Charity Bundle contains over $250 worth of gaming PDF products, for a mere tenth of the cost, with all proceeds going to support the work of the Southern Poverty Law Center. 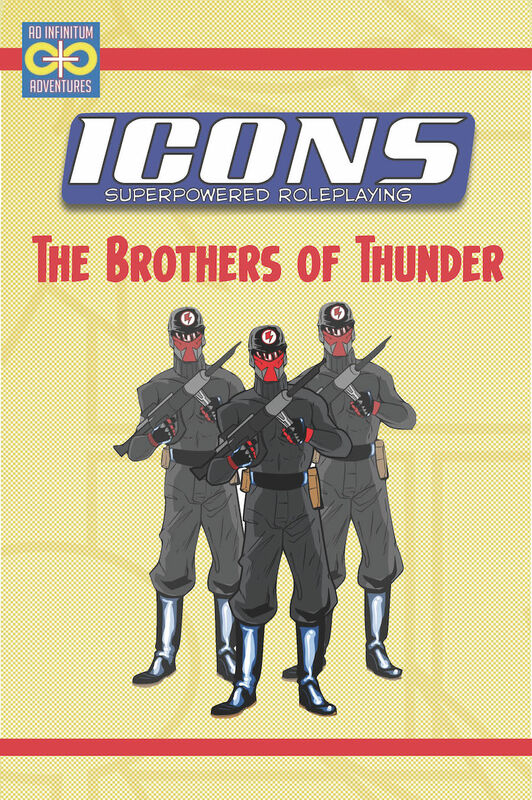 As part of this bundle, artist Dan Houser and I have created an all-new Icons product, a 7-page PDF on the neo-Nazi group called “The Brothers of Thunder” including background, adventure ideas, stats for their rank-and-file members and the Brothers two super-powered agents, the twins Donner and Blitz! Pit your heroes against the forces of hate and support a great cause in the process! So, by now, my small contribution to Ryan Macklin’s ’90s gaming magnum opus Katanas & Trenchcoats is out there. It all got started quite innocently (as these things do) when I replied to a Macklin tweet, astonished there wasn’t a “Katanas & Trenchcoats” RPG, given how popular the concept of adding Highlander-style immortals to nearly every RPG was back in the ’90s, especially White Wolf’s “World of Darkness” setting. Ryan took it upon himself to assemble an A-Team of game industry talent (plus, you know…me) to bring this vision into being, planned, of course, for an April 1st release. The plan was always to donate profits from the game to charity, particularly the Seattle Children’s Hospital. Ever the professional, Ryan offered to pay us contributors, and I accepted so I could donate (folding in some of my Ad Infinitum profit) to The Trevor Project, a charity and cause important to me, and to countless LGBTQ youth. Also ever the gentleman, Ryan followed that news by offering to donate to the Trevor Project as well. Should anyone else be so inclined, please visit their donation link and help out.